Since moisture will collect under your home’s overhangs, wood will deteriorate faster and lead to peeling and flaking of paint. The solution is aluminum soffit systems, engineered so air can circulate through your attic, helping to evaporate unwanted moisture and reduce heat buildup. Our soffit is available in both solid and vented panels to provide the right amount of ventilation your home needs. Our custom formed fascia is hemmed for added strength and continuously interlocked around your entire home for added peace of mind in tough weather. Why worry about areas that are exposed to the elements, when you can protect them with factory coated aluminum to match your home’s exterior color scheme? 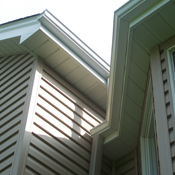 Our seamless guttering comes in 5” and 6” profiles and can be color matched to our soffit and fascia to further enhance the look of your home.